Following up on the enormous success of the Journeys of a Lifetime series of travel gift books, National Geographic bring you 100 Countries, 5000 Ideas, a large-format, lavishly illustrated, softcover travel planner. This essential travel companion to one hundred of the world's most fascinating countries is packed with more than 250 big, colorful images, 110 original, detailed maps, and evocative text to inspire your next great trip. Divided into two sections, this book helps you choose destination that suits your interests, how to get there, and what to do. The first part presents a series of charts that helps you pick the best places to visit according to your needs and desires, including the best seasons to go to each country--whether you're interested in a three-week vacation or a long weekend or something in between--as well as a chapter including which destinations are best for children, adventure seekers, history lovers, and the like. In addition to vacation ideas, you'll be given specific airfare costs, approximate cost of a trip, health precautions, and other important tips. The book's second section surveys the one hundred countries - from Argentina to Zimbabwe, and everything in between - describing each one's unique highlights and ideas on what to do while visiting, as well as offering a wealth of practical information to help plan a memorable trip. A special sidebar outlines the pros and cons of each destination. 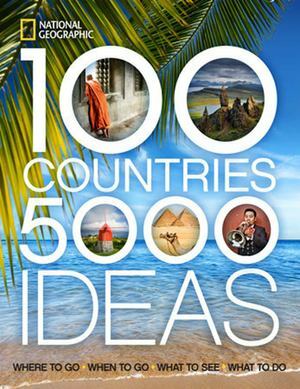 100 Countries, 5000 Ideas is an irresistible blend of practical travel information and inspiring ideas - adorned with stunning imagery - to help fuel your wanderlust, and make your dream trip possible.